Red River Camps: Want the perfect holiday gift for that special someone, why not treat them to the quite serenity of the Red River Camps. Red River caters to outdoor enthusiasts wanting to get away from it all. Fly fish for native brook trout, hike miles of trails, go hunting or spend your vacation just relaxing. Our main lodge, is large enough for family gatherings, intimate weddings, or unique corporate events. Here, you won't find cell service. You won't find cable television. You won't find hustle and bustle. What you will find is relaxation, nature, and a good reminder of the way life should be. Bear Hunting w/Eagle Mountain Guide Service: If you are looking for a that truly unique gift for that special someone, I can think of no present more thrilling or amazing than buying that person a Maine Fall Bear Hunt. Escape to the Maine wilderness, stay at a remote wilderness lodge, eat amazing food and have a chance at scoring a truly massive bruin . . . for most people this is a once in a life time opportunity. Imagine the excitement this Christmas as you tell your loved one that they are going this Fall on a Maine bear hunt! See more information including my Rabid Review of Eagle Mountain Guide Service and a direct link to Eagle Mountain Guide Service website for ordering information. Duluth Trading Company is the practical choice for outdoorsmen, mountain men and mullet sporting rednecks across the entire face of the planet. Whether camped out on the Alaskan tundra, chopping firewood in the remote wilds of Maine or climbing the north face of Mt. Everest, you are sure to find their rugged, non-nonsense flannel shirts and fire hose pants covering the backs of just about every human male with balls enough to call themselves “Man”. Carhartt clothing is busily preparing for winter with its new line of Mother Nature taming work wear, designed to defeat even the most brutal of weather conditions. Their Bad Axe collection, designed thoughtfully, with care and capable of shrugging off even the most horrific of weather conditions. The Sproul Baker Reflector Oven: I am regularly impressed by the quality of Maine based products found throughout the state. You certainly do not have to look very far to find skilled craftsmen plying their trade out of small shops, building superior pieces of handmade merchandise. Enter the innovative Maine company campfirecookware, located in the town of Bowdoinham, Maine. Here operating out of a small workshop, proprietor and master metalworker Chas Gill builds what can easily be described as simply the best campfire reflector oven on the market, the “Sproul Baker”. For more than 100 years, Field & Stream magazine has provided expert advice on every aspect of the outdoor life, including hunting, fishing, conservation, & wilderness survival. The magazine's annual Total Outdoorsman issue is one of its most popular, read by over nine million sporting enthusiasts. 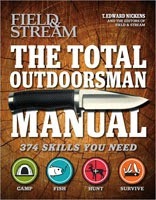 The Total Outdoorsman Manual is loaded with TONS of practical information for both the beginner & advanced outdoorsman, the book is an authoritative, comprehensive, & entertaining guide that outlines 374 essential skills that will enable almost anyone to master the outdoors and hunt, fish and camp like an expert. Learn how to hunt better, fish smarter, survive anything and camp anywhere.